The new union consisted of the former Afrikaner republics, the British cape colony and Natal, and the African tribes. The British parliament in granting independence hoped that these diverse groups would work together to form a country. It was to be a bitter union, however. Many blacks had supported the British in the Boer War, thinking that the British policies would be fairer to them than those of the Afrikaners since the Cape Colony had been fairly liberal in its treatment of blacks. However, under the new constitution complete political control was in the minority white population with little representation of the black majority. The increasing demand for cheap African workers ensured that this situation would not change. Resistance by Africans aimed at keeping their independence ceased after Bambatha's Rebellion of 1903. By 1909 80% of the adult males were working as migrant workers. Many blacks turned to sharecropping as an alternative to domestic service or work in the mines. In 1913 the government took steps to stop independent black farming and to keep the Africans as a labor force. The Land Act stopped Africans from working for themselves and from owning land outside of the native reserves. Even sharecropping was illegal. The reserves were mainly in the Transkei and Zululand and amounted to only 7% of South Africa. The foundations of apartheid had been established. However, a new generation of blacks who had been educated by the Christian schools of the more liberal Cape Colony, began a political resistance movement aimed at securing political and social equality. 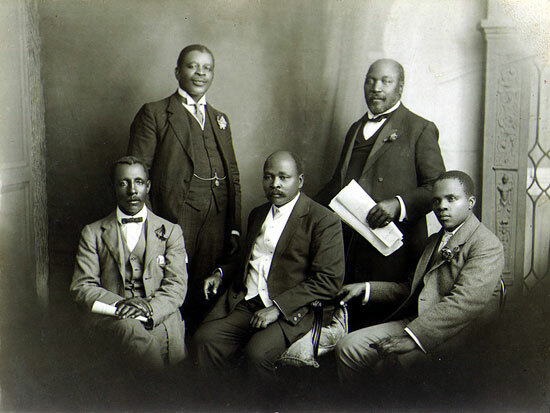 The South African Native National Congress (SANNC, later changed to African National Congress or ANC) was formed in 1912 and its first major effort was to protest the 1913 Land Act. After being unsuccessful in South Africa a delegation went to London to appeal to the British Parliament. They were unsuccessful but it was the beginning of a struggle which did not end until the free elections of 1994.